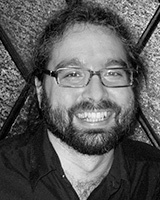 Jason Sabol, tenor, has been a member of Cantata Singers since 2004, and he has appeared with the ensemble as a soloist in works by Monteverdi, Handel, Britten, Schütz, Vaughan Williams, Schnittke, and as the tenor soloist in the world premiere of John Harbison's The Supper at Emmaus in 2014. He has also appeared with the Cantata Singers Chamber Series in Brahms’ Liebeslieder Waltzes and Zigeunerlieder, “Songs of War and Peace,” a holiday celebration at the Isabella Stewart Gardner Museum, a staged production of Kurt Weill songs, and as Japhet in Benjamin Britten’s children’s opera Noye’s Fludde. He gave the first performance of Rodney Lister’s The Angel that Troubled the Waters and, as part of the Fromm Foundation concert at Harvard, Luciano Berio’s A-ronne. He recently appeared with the Connecticut Early Music Festival. He also conducted the premiere of Robert Ceely’s Five Contemplative Pieces for Mixed Chorus at New England Conservatory. With Cantata Singers members Lisa Lynch and Carola Emrich-Fischer, Jason Sabol is a founding member of the Libella Quartet, a vocal ensemble that specializes in new music, has several premieres to its credit, and has performed at the WGBH All-Classical Festival. Dr. Sabol holds degrees in composition from Boston University (DMA), New England Conservatory (MM), and the Eastman School of Music (BM). Since 2005, he has taught mathematics at the Corwin-Russell School, serving gifted students with special needs.